What’s the difference between timber frame, log frame, and post and beam construction? Timber framing uses mortise and tenon joints to connect heavy wood timbers together. The process is intricate and much like crafting a piece of furniture on a large scale. Log framing uses horizontally stacked logs to create walls. Post and beam construction uses uprights posts to support horizontal beams that can be joined with metal brackets or traditional mortise and tenon joinery. Each has a distinctive visual aesthetic and its own set of pros and cons. What are the benefits of timber framing? Energy Efficiency – Most often, timber framed structures are enclosed with an envelope of insulated panels. This creates an extremely energy-efficient enclosure with a high insulation rating (R value) and little to no air infiltration. Flexibility — A timber frame structure carries the loads within the heavy timber framework, leaving little need for interior load-bearing walls. This enables open, flexible interior floor plans, often with significant ceiling heights. 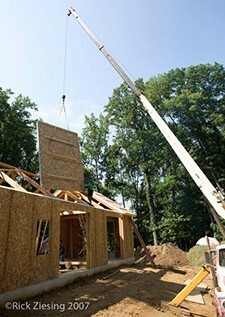 Longevity — Timber frame construction is extremely stable. Buildings constructed hundreds of years ago remain standing today. Aesthetics — A timber frame building displays its architectural integrity and embraces you with warmth, strength, and the beauty of natural wood, while the knowledge of the structure being handcrafted by caring people adds a palpable quality. Do you offer a design service to help with my plans? Hugh Lofting Timber Framing can provide varying levels of service to homeowners, architects, or contractors. We will work with you and your design and construction team to provide consultation or comprehensive design services, depending upon your needs. What are some things to consider with timber framing? Efficiency of frame design — The complexity of your frame design will influence the amount of wood required and the overall cost of the project. In the same floor plan, a bent or two might add 20-30 percent more timber to the project, changing the budget significantly. Wood selection — You’ll choose between old growth or second growth green wood, kiln-dried wood, or recycled wood. Drier, denser wood will be more stable, with less checking or cracking over time. Wood species selection will be based on aesthetics as well as availability; some species are available in longer lengths while others offer greater strength in smaller dimensions. Site requirements — Is your project site easily accessible? Accessibility to your site will be a factor in determining cost and complexity. Can a truck and trailer or a crane drive onto the site, or will extra handling be required? Other construction — Will the timber-framed structure stand alone or be part of a larger building? Choosing to do part of your project as a timber frame and part as traditional stick construction – what’s known as hybrid construction – can affect the overall project budget as well as aesthetics. Interior and exterior finish materials will also impact your budget.